In the summer of ’98, I drove from Nashville to Peoria, Illinois and back again in a day, in a tiny tuna can of a rented car. I took my daughter for her first visit with her paternal grandparents. She was six. After a weekend with her grandparents, her father was going to pick her up and take her to his home in Minneapolis for her first long visit. Six weeks total, she would be gone. The ride up was fun. We listened to chapter books on tape, checked out from the library. We played road games. We sang songs. We picnicked at a rest stop, polishing off the pimento cheese sandwiches and chips. Grace lectured me about drinking so much caffeine as I finished another Diet Coke. We arrived at her grandparents and we all spent a few awkward minutes visiting in their modest den before I said my good-byes and left. I didn’t know much about her grandparents other than they hated me. I tried not to take it personally. My parents would have gladly roasted marshmallows over the fire-crisped corpse of their son. The rental car didn’t have a CD player, only cassette, and a tinny radio. I had shoved a handful of cassettes in a bag as I left, not paying much attention to what I grabbed. After I got out of town and away from a decent radio signal, I pulled the bag up on the seat beside me and rummaged around. It was then I realized every cassette I brought, save one, had been a cassette I purchased in the summer of ’92 for a solo cross-country drive, the summer I became pregnant with my daughter.That one cassette was the eponymous “Fleetwood Mac” album from 1975. 1975 was a big year for me. I turned six that summer, too, just like my daughter. My parents’ divorce was finally, finally, finished. My mom married my sweet step-father. My father re-married. I remember a summer spent at the apartment complex swimming pool, my mom baking under the coconut aroma of Hawaiian Tropic tanning oil. Me, with a strip of white zinc oxide on my nose. The speakers set up around the pool blasted Paul McCartney & Wings, The Eagles, and Fleetwood Mac from the radio. A day of driving soon turned to night and I drove, alone, past cornfields and soybeans and finally, cotton, letting me know I was getting closer to home. 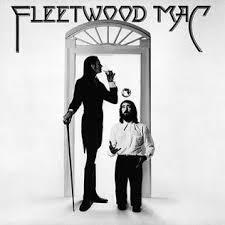 I played that cassette over and over again, ‘Landslide’ especially. It might have been the first time I listened to the song as an adult. On that drive, I think I felt every emotion possible. I’d never been away from my daughter for more than a few days. I didn’t know how things were going to go. I didn’t know anything about anything, really. With no one to talk to and nothing else to occupy my mind, I thought about everything that had happened since ’75. I thought about everything that had brought me to that day. All the decisions I’d made, bad and good, that had landed me a woman raising a child on her own. I thought about all the things I could have done better. Right outside of Jackson, TN, fatigue finally got the best of me. I pulled off at a highway rest stop. I went in the ladies room and splashed cold water on my face. But I knew it was useless and so I went back to the car, leaned the car seat back and tried to nap, the car running to keep the A/C going and that music playing in the background. Lots of things happened that summer. I bought a house. I got fired because I declined my boss’s sexual advances the day I closed on the house. My daughter spent the summer away. I had a nice little breakdown. There were family blow-ups all around. Like that summer of ’75 when I was six and lived on the edges of the adult world. Every time I hear that song now, ‘Landslide’, I think about those two summers, how much they shaped me, how I didn’t even know yet what I didn’t know. I can hear the bounce of the diving board. I swear I can smell sun tan oil, right now.